The Mediterranean region is one of the most robust culinary hotspots in the world. The poignant cultures enveloping Greece, Italy, Spain, France, Morocco, and Turkey, with traces of Egyptian influence, is fertile ground for an imaginative menu. 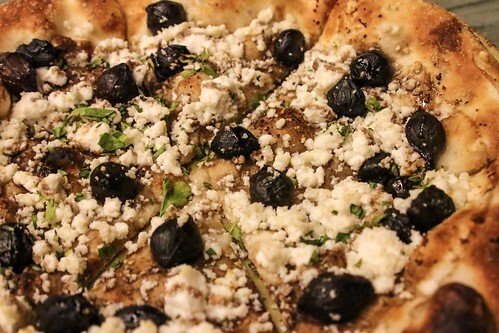 This geographic basin utilizes the freshest ingredients founded in wheat, grapes, olives, and the freshest meats and seafood. 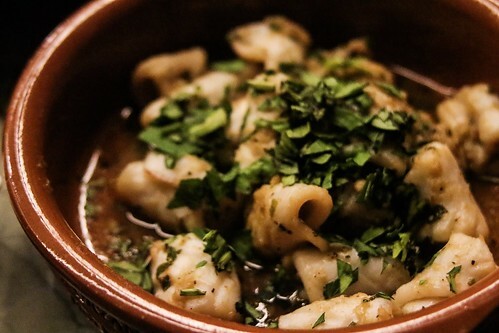 These traditional flavors and techniques give birth to a cohesive assortment of tapas, mezzes, antipasti, pastas, pizzas, entrees, and sweet endings that capture the taste of the Mediterranean. 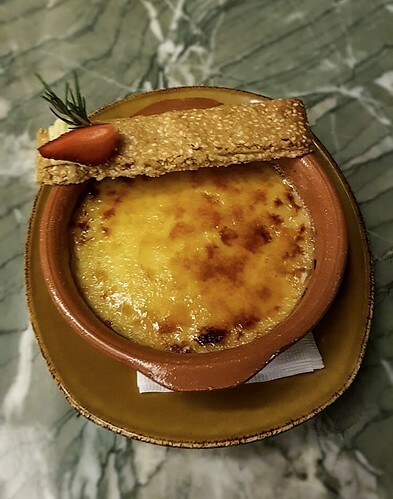 Chef Luis Chikiamco, Executive Chef of Discovery Primea, with his extensive culinary background spanning over a decade in kitchens in Mexico, France, and the Philippines, has recently revamped the menu of Restaurant Tapenade. The inspiration takes off from a truly Mediterranean spirit that is reminiscent of salty coasts, fresh countrysides, sunny islands, and exotic landscapes analogous to the region. The menu might be daunting at first with 11 appetizers, 17 pasta dishes, 14 pizzas, five (5) light lunch options, five (5) deep fried dishes, four (4) from the rice harvest, eight (8) mains, and six (6) desserts, but the flavors are well within the range of familiar and at the tipping point of exotic. 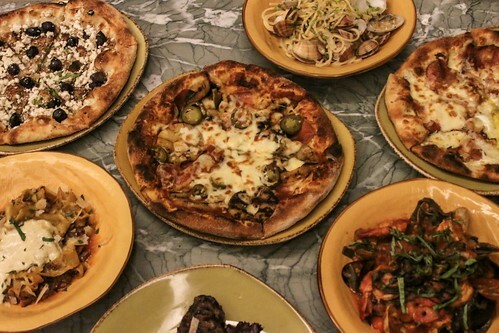 The Foodie Station got invited into a sneak peak of this new menu inside Restaurant Tapenade, Discovery Primea’s all-day dining outlet. Of the 70 dishes, we got to sample 22 which were masterfully picked and prepared by Chef Luis himself. Each plate builds on the next without dissonant clash. 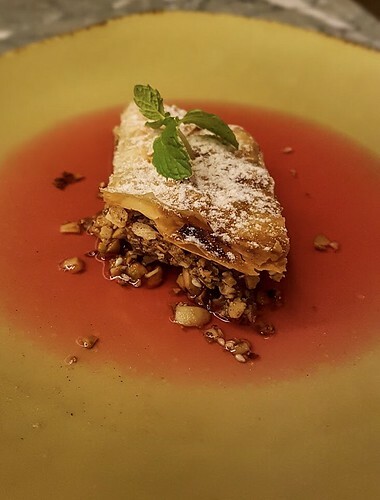 That’s the beauty of Mediterranean food; despite coming from a specific country, it’s an interrelated medley that creates a symphonic blend of aromas and flavors that titillate one’s senses. Let’s take the gastronomic tour of some of the finest and most delectable delights from that 5-hour dinner hosted by Discovery Primea. 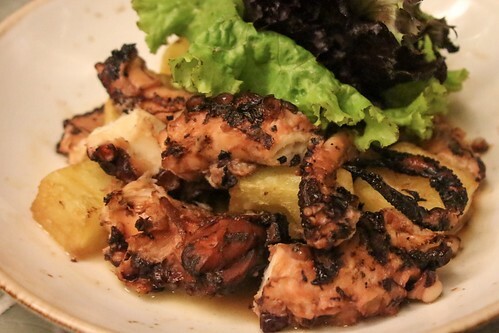 The dish is classic tapas using grilled octopus with roasted potatoes and Spanish paprika vinaigrette. Normally, pulpo is sliced thinly to create a tender bite, but this dish is confident enough to use chunks of tentacles with salty smokiness that is enjoyable with every bite. This version highlights the sweetness of the plump shrimp sautéed with garlic in good olive oil. Roasted tomatoes provide the acidity that is lifted by a swig of brandy and a warm Spanish paprika sauce. 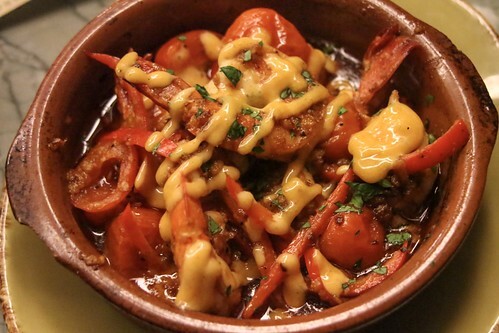 Do as the Spanish do and let a piece of bread sop up the sauce as you finish the gambas. 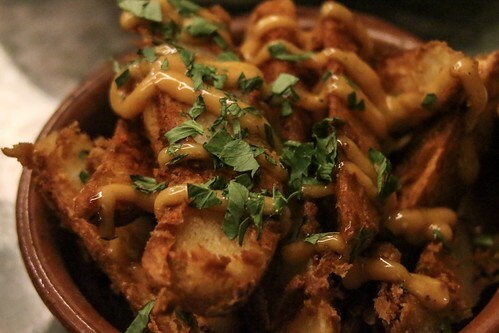 The underrated fried potato cubes are given an upgrade in this form. Crispy potato wedges, which we guess are double fried, have a textural crunch that is the perfect vessel for a sprinkling of spicy salt and paprika mayo. This is another dish that is meant to be eaten with a fork on your left hand and crusty bread on your right. 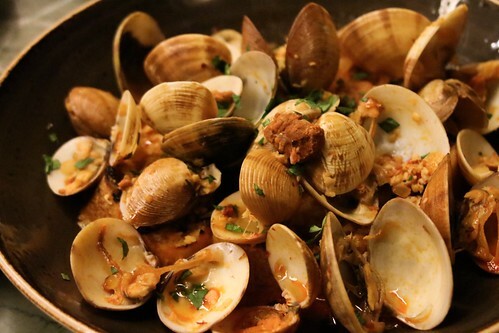 Fresh Manila clams are braised in white wine with crumbled Spanish chorizo and fresh herbs. 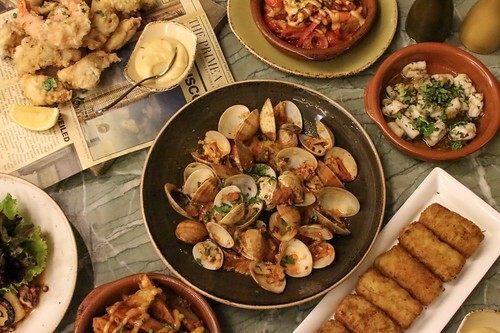 The spiciness of the chorizo and the salinity of the clams is an age-old surf and turf take on tapas. Squid when cooked too long can get tough. Since it is meticulously scored and flash-seared, hence a la Plancha, the squid remains to be supple. Slightly toasted garlic, Spanish sherry vinegar and Aceite Virgen Extra (that’s extra-virgin olive oil in fancy parlance) coat every piece of calamari. 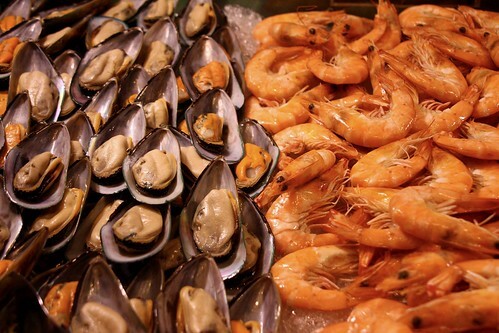 This preparation is born out of traditional Italian coast cooking that makes fresh seafood the hero. 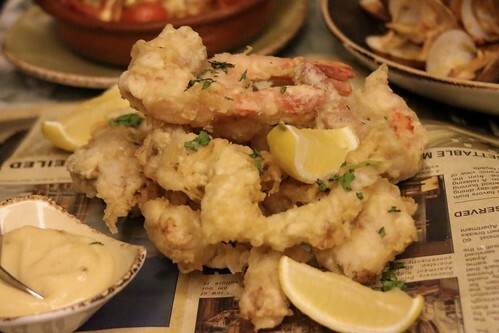 Squid, shrimp and snapper are crispy fried in a light batter and served with lemon-garlic mayo. An additional spritz of lemon revitalizes the freshness of the dish which is of pleasurable simplicity. 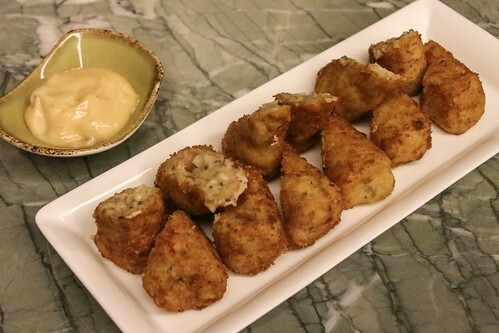 The quenelles of roasted chicken, ham, and black truffles are so unassuming when fried as croquettes. Do not let this pedestrian-looking dish fool you! The exquisite aroma and flavor of the truffles accentuates the saltiness of the ham that is gently being caressed by creamy mashed potatoes. 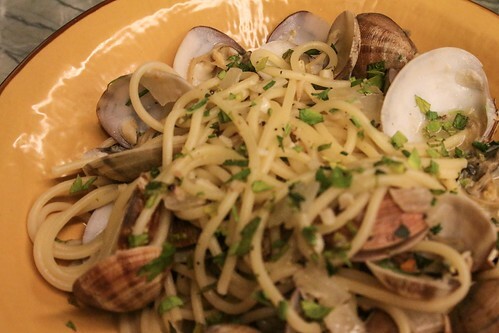 Popular throughout Italy, and around the world, because of its lightness and simplicity typical of Southern Italian cuisine is spaghetti infused in clams, garlic, parsley, and white wine. The pasta dish highlights the flavors of the fresh ingredients and focuses on simplicity rather than sophistication. Homemade squid ink pasta brimming with garlic baby shrimp, Chilean mussels, snapper, clams, cherry tomatoes, and basil. In Italian coastal towns, a dish is not just a dish – it’s a memory. Each forkful of the homemade pasta is reminiscent of days spent under the sun, wading in clear waters or laying on golden sand. The rich and chunky beef ragu simmered in red wine and tomatoes for hours thickly coats the fresh pasta. 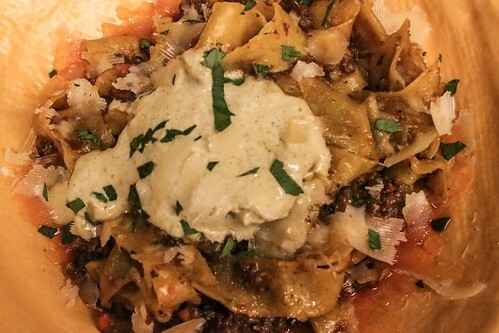 There is just enough sauce to moisten the tagliatelle as the meat is definitely the star. As if shavings of Parmesan cheese aren’t enough, a dollop of whipped herbed cream crowns the plate with luxurious richness. They say it takes a brave man to offer a Neapolitan a pizza with pineapple. Pineapple on pizza has caused one too many arguments, but in matters of taste, there can be no disputes. 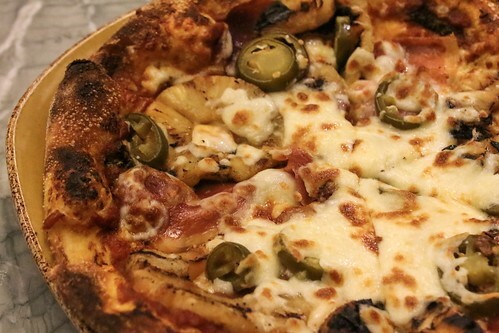 The smoked prosciutto ham, pickled jalapenos, and grilled pineapple topped pie is arguably the best version of the controversial Hawaiian pizza. While balsamic might trace its nature to Italy, we would like to think the creation also borrows a bit from French influences – fruit and cheese platter. Balsamic-glazed pearl onions have this sweet tartness which is a counterpoint to the tangy and creamy Davao goat cheese. Chopped parsley is added to finish this pizza that only has three (3) ingredients but has very complex flavors. Most anyone would agree that cured meat, cheese, egg, and black truffle cream are the makings of a hearty breakfast. These seemingly rich ingredients are good for making the most important meal of the day, and for topping pizza as well. 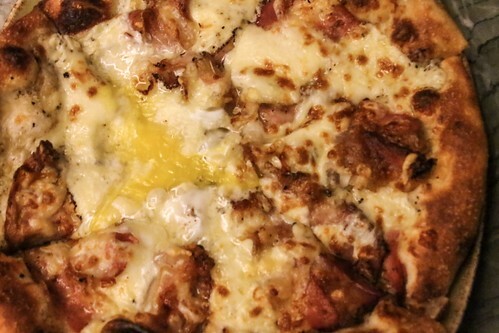 The strong flavors of Italian guanciale and black truffle cream go wonderfully together, and the free-range egg makes the pizza even creamier. Duck rice is quintessentially Portuguese, ask any Portuguese grandmother. Nothing says “heirloom recipe” more than a one-pot rice dish with tender duck meat, red wine and smoked sausages. 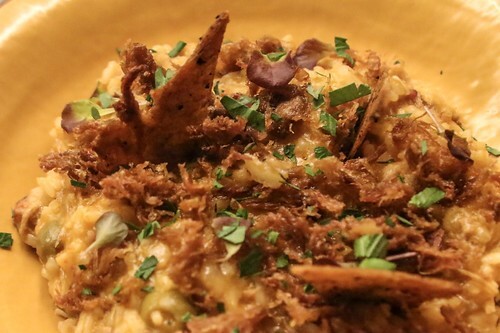 Tapenade’s version has crispy duck chicharron atop a bed of flavorful rice with chorizo and olives. 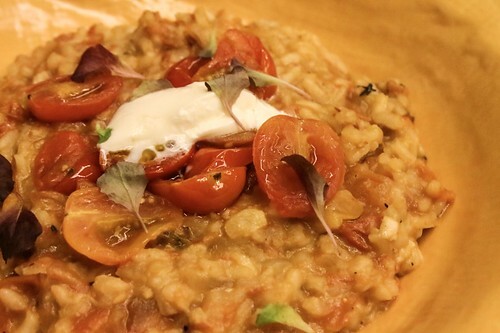 One solid proof of the old adage “there is simplicity in beauty” is risotto made with tomatoes and fresh herbs. It’s a dish that tastes rather simple, but is prepared with such complexity. The flavors are pretty straightforward and outright comforting. A Tapenade signature dish that everyone raves about! Imported rib eye is crusted in dried porcini and precisely seared to barely medium doneness. 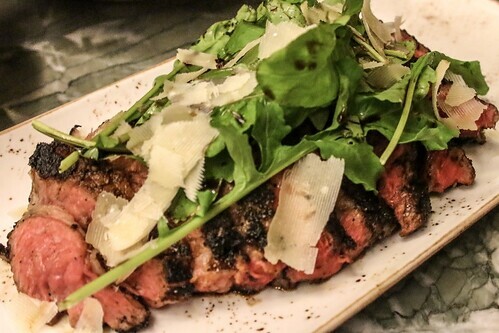 The juicy meat, toasted steak fat, mushroom coating, drizzle of balsamic, shavings of fresh parmigiano-reggiano, and arugula greens are layers upon layers of umami that makes your mouth water throughout the meal. 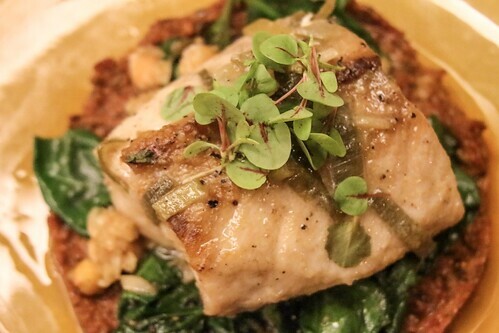 A generous fillet of snapper sits on top of Sicilian sundried tomato pesto, wilted spinach, and crispy chickpeas. 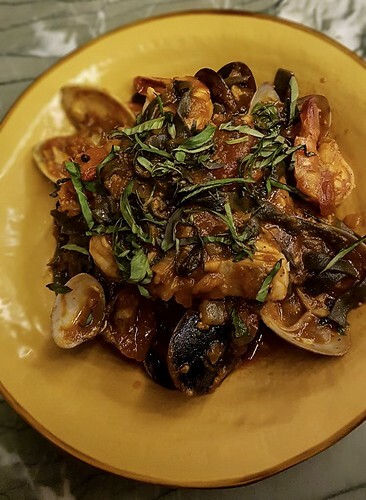 The tomato sauce is very earthy with a deep concentrated flavor yet it does not overpower the lightness and subtle briny character of the fish. 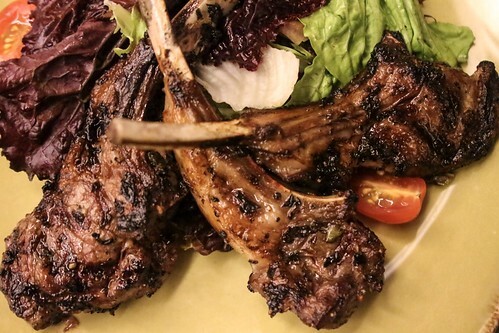 When lamb is served with “frenched” (exposed) ribs, it’s an invitation to pick it up with your hands, not as an act of impoliteness, on the contrary, a sign of reverence for the hands that crafted the dish. Fragrant rosemary, honey, and mint are the main flavor profiles you will notice as your teeth sink into the tender meat cooked to a medium rare, as lamb should always be. Dipping the chops in the lemon-mint ricotta is also encouraged. What can make a rich dessert more decadent? They make their crema Catalana with Tahini (crushed roasted sesame paste) providing a nuttier taste to the custard. A sesame cookie further enhances the sesame flavor and creates textural contrast. The signature burnt sugar crust is enough sign that this is going to be an amusing and gratifying dessert. 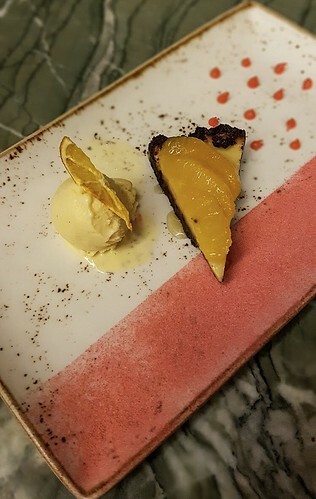 Starchy desserts after a hearty meal may be overwhelming, but this pie topped with caramelized oranges and served with vanilla ice cream is refreshing with just the right amount of sweetness. 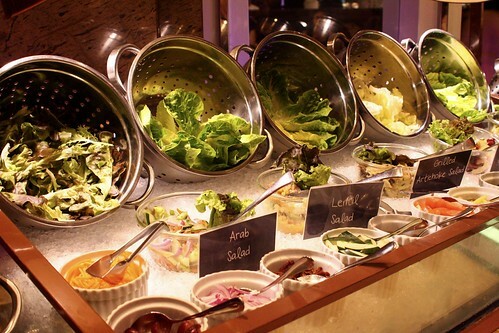 This is not your typical hotel buffet Tiramisu. Its cute presentation on a canning jar really stands up to the literal translation of the dessert, “pick me up”. They use real sweet Italian mascarpone making it light, sharp, and airy. Espresso ladyfingers add the right cushion between the cream and the ameretti cookie. 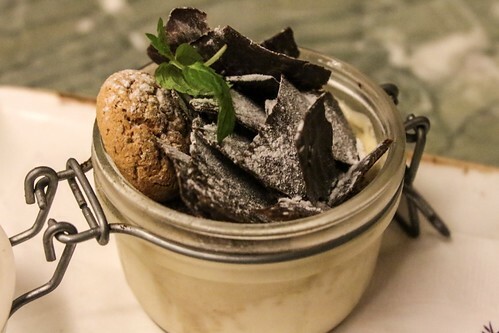 Large curls of chocolate shavings adorn the top of the Tiramisu until the whites are barely peeking. To complete the Mediterranean experience, ask your servers for the suitable wine pairing for your meal. That night, we had glasses of chilled cava poured throughout the meal which served as a palate cleanser; with sweet aromatic notes taming some of the punchy spices highlighted in the course. Nothing like smooth sparkling Spanish white wine on a summer night to create one memorable Mediterranean feast worth celebrating! Restaurant Tapenade is open from 6:30 to 10:30 AM for breakfast, 11:30 to 2:30 for lunch, and 6 to 11:30 PM for dinner. For inquiries and reservations, please visit call +63 2 955.8888. 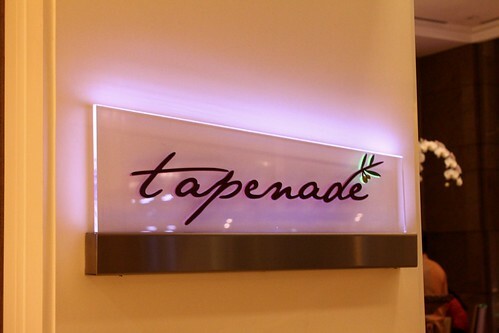 Restaurant Tapenade is located at the ground floor of Discovery Primea, 6749 Ayala Avenue, Makati City.